The Canadian prairies are where Ryshia Kennie makes her home with her husband and one opinionated and slightly geriatric, Irish Terrier. 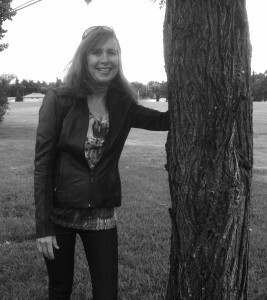 The winner of her city’s Writing Award in 2011 and a semi-finalist in the Kindle Book Awards, her novels have taken her characters from the depression era prairies in her first book “From the Dust” to the ancient stones of Angkor Wat in her latest book, “Intent to Kill”. There’s never a lack of places to set a story as the too long prairie winters occasionally find her with travel journal in hand seeking adventure on foreign shores. While facing off a Monitor Lizard before breakfast or running through the Kasbah chased by an enraged Water Carrier aren’t normal travel experiences and might never find a place in one of her stories, they do make great travel stories. But sometimes it’s the memories of those exotic worlds, the smell of the spices, the words of a stranger, the furtive look one man gives another, that often become the catalyst for a suspenseful story with a deadly villain and an intrepid hero and heroine who must battle for their right to love or even their right to live, in a place that neither, or both, may call home. I’m inspired to write because I want to explore the human condition, to understand it better – and to share that discovery – and of course, I like to entertain too. Writing is something I’ve done for as long as I can remember – from that first diary as a child, or maybe as early as that very first book that someone read to me – I can’t remember, only that the inspiration to put words on paper has always been there. What inspires a story? It might just be a newscast of some craziness that has occurred in the world or a look or a touch between two strangers on the bus will have me considering other relationships and new stories. A tragedy whether near or far reminds me of how similar we are despite how different we think we are – and I want to write that, to tell that in a different way, in another story. Sometimes it’s just as simple as the feel and smell of a warm summer day bringing back a memory. And often the inspiration of the story only becomes one line in the book and the story evolves into something completely different, in fact that’s often the case. I am a semi-reformed seat of the pants writer. I begin a story usually with a place and often with a first line. From there i build the setting, which I think of as the home for the story and it’s there that the characters start to take shape. Now this is all in my mind, usually none of it is written down until I figure out who my characters are. That usually begins with occupation and then the blanks start to fill in as I think about who they might be and how they might interact with each other. I will write a rough first page at this point and then start drafting a synopsis. Once I have a rough synopsis I start writing and write a good draft of three chapters, this is my anchor or guide along with the synopsis. From there I go on to write the full story. I listen to my characters but I don’t interact with them, at least not knowingly. I’m a visitor in their world and they kind of lead my fingers and while I know what they’re trying to do, I’m often surprised about what they do while they’re trying to get there. Read your rejections and yes, even read your reviews. A pattern will more than likely emerge and tell you what’s working and what’s not. Yes, I get that rejections are painful but sometimes they are very insightful. And reviews can be as flattering as they can be misguided, hurtful and many things but sometimes they’re bang on – and again, if a pattern emerges you may be doing something right or maybe something very wrong. Either way, you can’t fix it if going forward you don’t know it’s broken. I wish you could always choose your publisher but unless you’re self-publishing with no middle man, that’s a luxury most of us don’t have. What I did do was factor out who I didn’t want. I wanted a publisher, big or small, conventional or not, that would be discriminating about what they published and not hesitate to reject something that didn’t meet standards. Book publishing is definitely in a state of flux. What the future will be, I don’t know although one thing is certain e-publishing and self-publishing are here to stay.